120 days...by M. Stratton truly gutted me emotionally and brought back lots of memories for me. Two and half years ago, I first hand experienced the impact of what it means to lose someone close to me to cancer. Cancer is not something we think about it since we all think it will never happen to us or the people we love but sometimes when we least expect it, it happens. Reality hits that possibly life might be cut short. And when I was spending the last few weeks with my mom, every regret, memories, and I love you's comes rushing back at you like a raging storm. 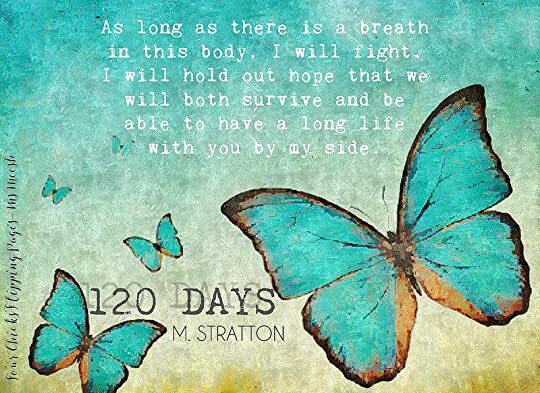 And in 120 days, M. Stratton has written one of the most raw, touching, beautiful, and emotional book that I have read. In this emotional tale, she has managed to bring light on this delicate and sensitive subject of cancer, death, life, and acceptance. 120 Days though may be a cancer book but it is so much more. It is about truly understanding terminally ill patients and their last moments of living. Though they may experience pain and death is knocking on their door, it is about the hope, light, happiness, and acceptance of it all. 120 Days truly gutted me and left me bawling throughout the story. My heart and floods of memories came rushing back and so I understood the emotional heartache of Ethan as he relives and experiences what his brother's last moments through the eyes of the people at the Last Resort and Samantha. This book is tragic but really beautiful. 120 Days engulfs you with so many emotions that it reminds readers of the beauty of second chances, finding love, experiencing life, and acceptance. This is my first book from this author and it won't be me last. M. Stratton was able to showcase a strong voice of her characters in a well-written story.